Guys! This is the best gift guide for my food loving friends. Two gift guides in one today! This is my 2018 cookbook gift guide and it is TOPS. Most of the books are new to this year (some are still preorders!) and they are all just incredible. And yes, I did a little shameless promotion with my own books too. I could go on and on about what I love in these books. They are all chock-full of delicious recipes but many also have fun and endearing stories, and I love that. I read cookbooks like novels! So here we go: a list of my favorite 2018 cookbooks! 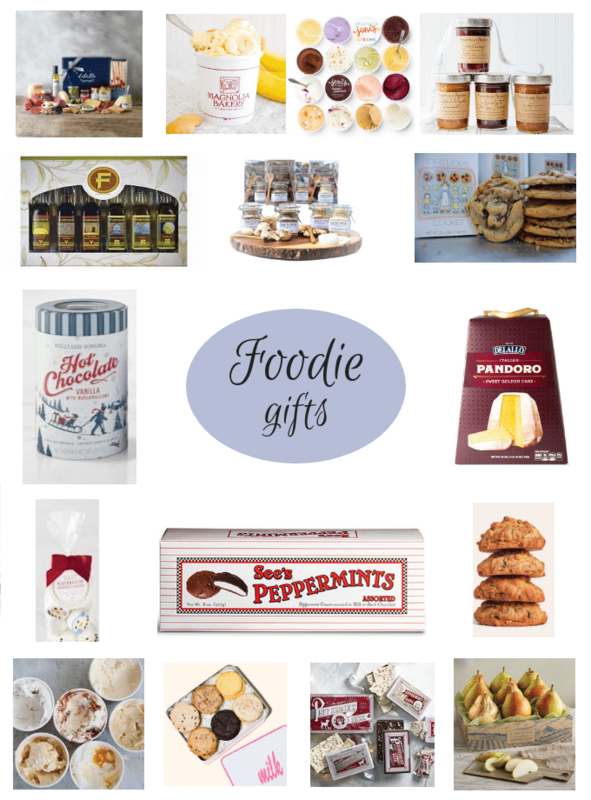 I also wanted to share some of my favorite foodie gifts to give during the holiday season. I’m always looking for awesome ideas to send for either holidays or as thank yous. I’d love to hear if you have any favorites below! As for these ones, whether you send them or show up with them at the door, I’m absolutely obsessed and have sent or received every single one of these. I mean, this stuff is GOOD. Some of the smaller ones make for great gifts along with the cookbooks above! DeLallo Foods Gift Sets. Everything you need for a cheese board (or an actual cheese board!) is right here. Magnolia Bakery Banana Pudding. I am ridiculously excited that we can order this online now. It would be an amazing family gift. Jeni’s Ice Cream. Having a six pack of Jeni’s ice cream show up at my door is basically the best day ever. You can also do a pint club! American Spoon Gift Sets. I rambled about American Spoon constantly, but with good reason. Their gift sets are to die for. Fustini’s Oils and Vinegars. I adore every oil and vinegar that Fustini’s makes. They are so so good. Saltopia Salt Gift Sets. You don’t even want to know how many jars I have. These flavors of salt are incredible. Tom’s Mom’s Cookies. Best cookies of your life. I swear! Williams Sonoma Hot Chocolate. We loooove this hot chocolate. I gift it every single year! It’s legit hot chocolate and a huge hit. DeLallo Foods Pandoro Cake. This is new to me and I’m obsessed. I tried it a few weeks ago. I love the box it comes it. It makes amazing french toast and bread pudding, but it’s also delicious served with fresh whipped cream and berries. It’s almost like brioche! Williams Sonoma Marshmallows. I adore these marshmallows for both hostess gifts and stocking stuffers! See’s Peppermints. If you’ve never had these before, they are like peppermint patties… but a million times better. Levain Bakery Cookies. I can’t even stand that we can order these online. Definitely in my top three favorite cookies ever. Salt and Straw Ice Cream. I’ve ordered this a few times and it is just to die for. Milk Bar Cookies. I love the chewy cornflake cookies, but Eddie loves ALL their cookies. He loves the birthday truffles too! Williams Sonoma Peppermint Bark. This is a quintessential classic that I can’t pass up in the holiday season. Best gift ever. Harry and David Royal Riviera Pears. By far, the most amazing pears. My dad used to get boxes from work when we were kids. I can never find a pear as delicious! I second Tom’s Mom’s Cookies. One time 14 years ago while visiting Harbor Springs, I stopped in their bakery to buy a pack for my dad, whose name is Tom. I have never forgotten their greatness! Your gift guides have been outstanding this year! I am eating them up- thank you! Thanks for the lists. Now I can give to my husband to buy me exactly what I want. Ok this might get some sadclonface reactions, but frozen pizza from Lou Malnatti’s in Chicago is one of my favorite gifts. It’s dumb expensive for FROZEN PIZZA but it’s delicious, comes packed in dry ice, and they do go on sale occasionally! I’ve received them as baby gifts when I had both of my kids (one three weeks ago!) and we adore them. I’ve also sent them to bunches of people for holidays or other gifting times, and they’re always a hit. I also like having a savory option for mailed food gifts.